On 14-16 October 2016, I held a weekend photo workshop in Southern West Virginia in the vicinity of the New River Gorge, using the centrally-located town of Beckley, WV as my base of operations. Typically this is a good time to photograph fall color in this mountainous region but this year had been drier and warmer than most. Leaves were just beginning to turn autumn colors and there was more brown than gold. But no mater what the conditions, you can always find great photo opportunities locally. New River Gorge National River, a part of the National Park System, protects 53 miles of the New River and covers 70,000 acres of the surrounding area. The following is a summary of locations with photographic potential based on my observations during scouting trips to the area and this year’s and past photo workshops. The New River Gorge Bridge is the longest steel span bridge in the western hemisphere and is the third highest in the U.S. The nearby Canyon Rim Visitor Center provides an overview of the area and nearby trails provide views of the bridge. Just north of the visitor center, off of route 19, is Lansing-Edmond Road, a narrow winding road that leads to trails accessing the canyon rim. From the Fern Creek Trailhead Parking lot, it is a relatively easy hike to the rim of the canyon where you can photograph the river, bridge, rafters, and the walls of the canyon. Diamond Point is one of the more popular overlooks, but there are numerous others that can be explored as well. 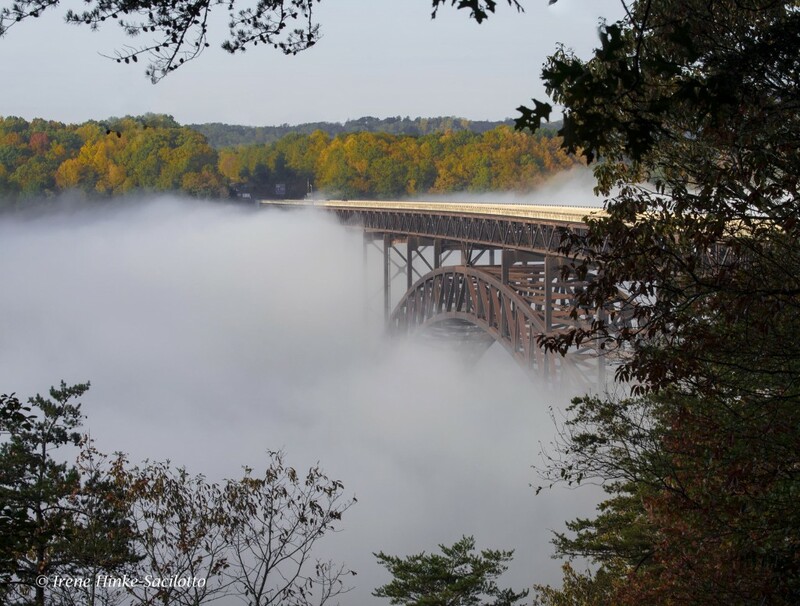 New River Gorge Bridge emerging from fog. 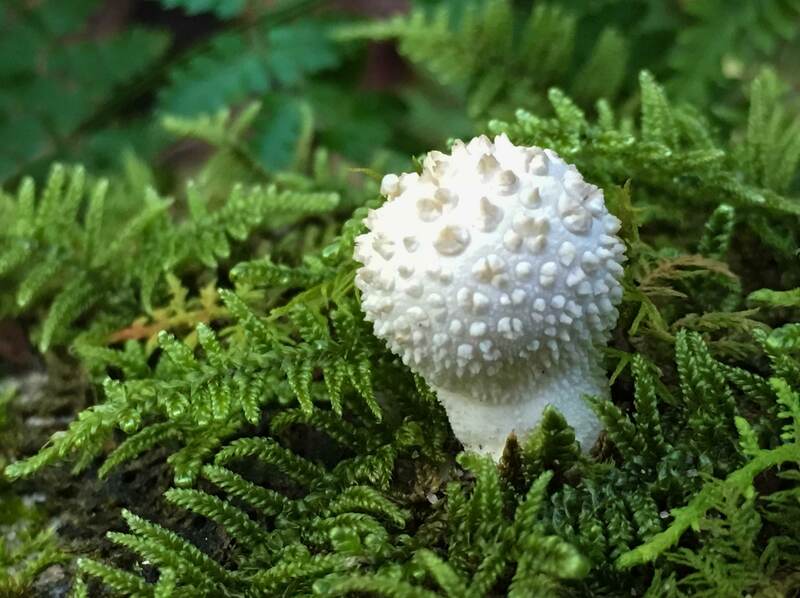 Cell phone shot of a mushroom along the trail to the canyon rim. 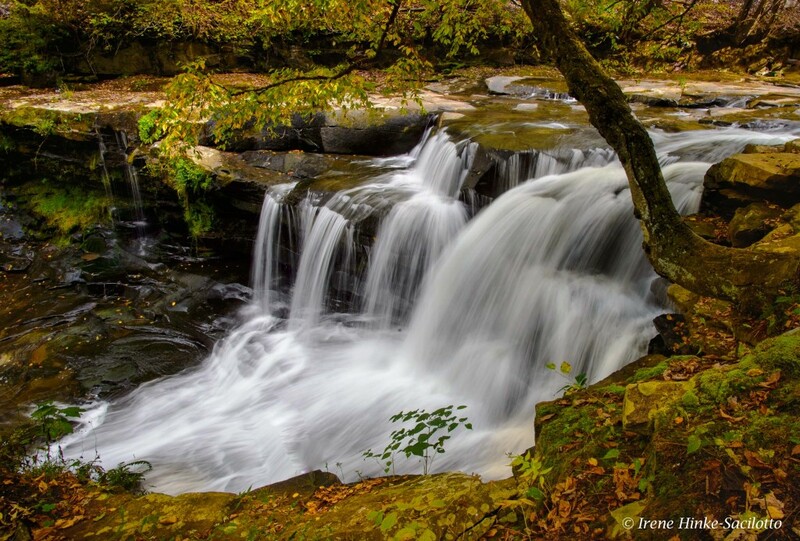 The park is approximately an hour drive from Beckley, WV on back roads. I typically time my travel to arrive shortly after sunrise. This year mill’s water wheel was not turning due to damage caused by a severe flood in June. It is more likely to be operating in the spring when there is more water flowing in the adjacent creek. 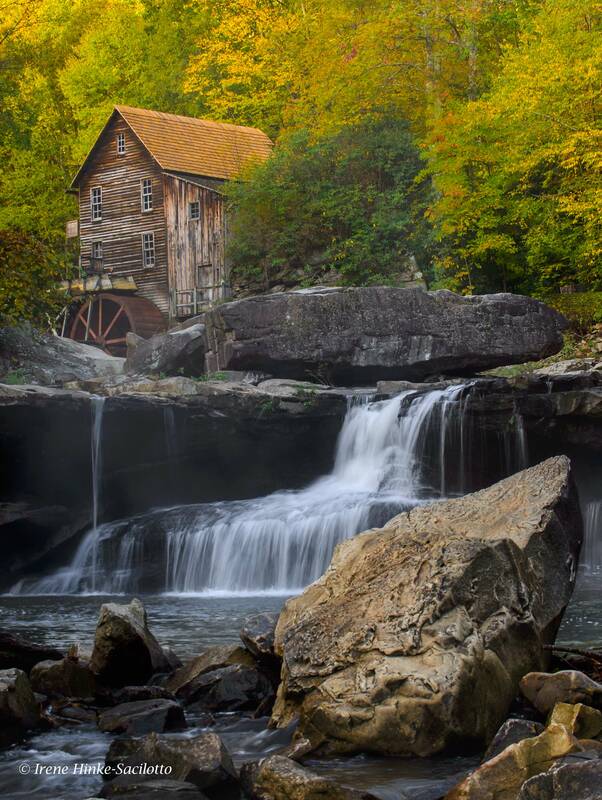 As with most of the locations visited this fall, the color of the surrounding trees was not intense, However the mill with the falls below still presents a number of interesting photo opportunities from both sides of the creek. Soft light is best at this location since on a sunny day as the sun moves higher in the sky, the contrast between the trees surrounding the mill and waterfalls intensifies. 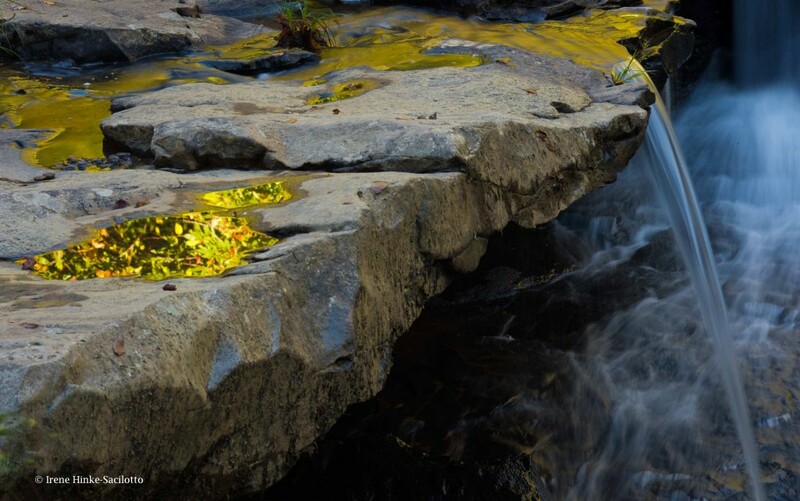 During this visit, I looked for subjects other than the mill to photograph, such as softly lit sections of the creek and colorful reflections in the water. Glade Creek Grist Mill. Photo taken a number of years ago with better fall color. Reflections in puddles from surrounding trees. Falls at Glade Creek Grist Mill, Babcock State Park. 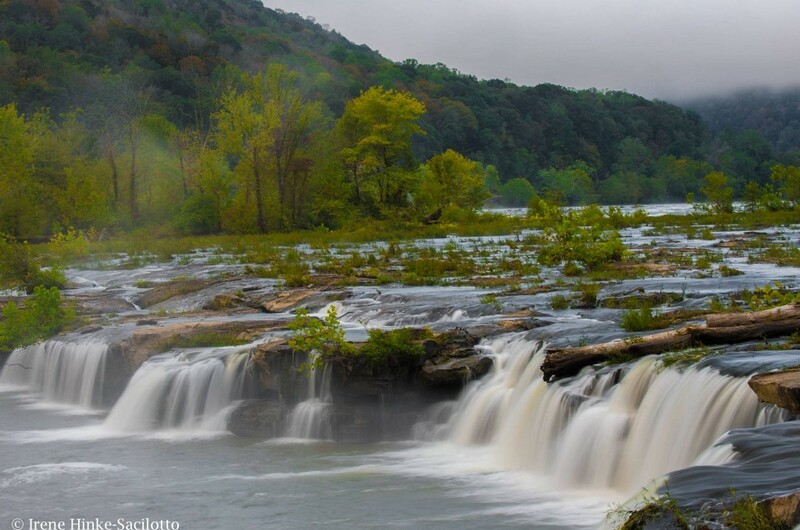 Sandstone falls is the largest waterfall on the New River. Located at a wide point in the river where it is divided by a series of islands, the river drops 10 to 25 feet. 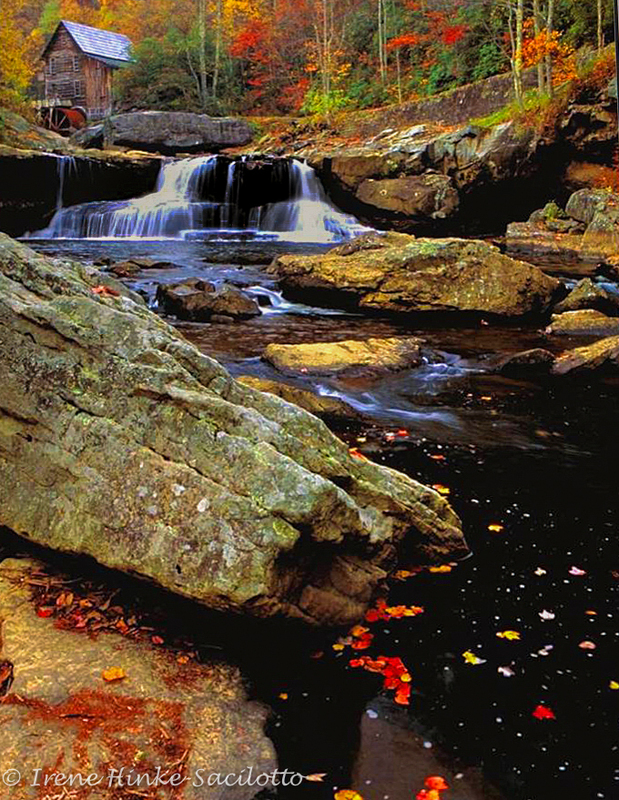 A boardwalk with overlooks span the waterways and offer a number of views of cascades and main falls. The first overlook is my favorite, where there is a series of small falls fanning out in a horseshoe shape. There are places to photograph both from the boardwalk and river bank. Access to the higher upper falls is not always possible dependent on the water level. To reach this section of the National Park, go to the small historic town of Hinton where you cross the New River and travel parallel to its path until you reach the park. (Approximately a one-hour drive from Beckley.) 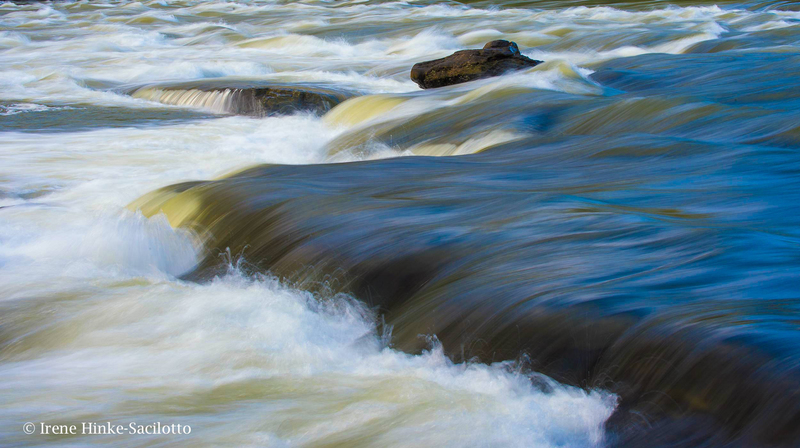 A neutral density filter will enable you to slow shutter speeds for an artistic presentation of the water’s flow. These filters are neutral gray and reduce the amount of light entering the lens. Some are variable in strength and therefore are more versatile. Remove your UV filter before mounting these or a polarizer on your lens Besides extra layers of glass that can soften your image and contribute to flare, when using a wide-angle lens, vignetting of the image can occur (darkening in the corners of the frame). Each time I have visited the park, photographic opportunities differ. As I was leaving the area this time and heading back to Hinton, I noticed the backlit spray of water from the main falls and foreground trees and took the photo below. Intrigued by the backlit spray from sandstone falls and the foreground trees, I could not resist taking this photo. The above photo was taken by one of my 2016 workshop participants, Gary Carlton. He used a variable neutral density filter to for the first time to blur the movement of the water. Pleased with the results, he submitted this image during the critique portion of the program. New River downstream from the main falls photographed with a slow shutter speed. 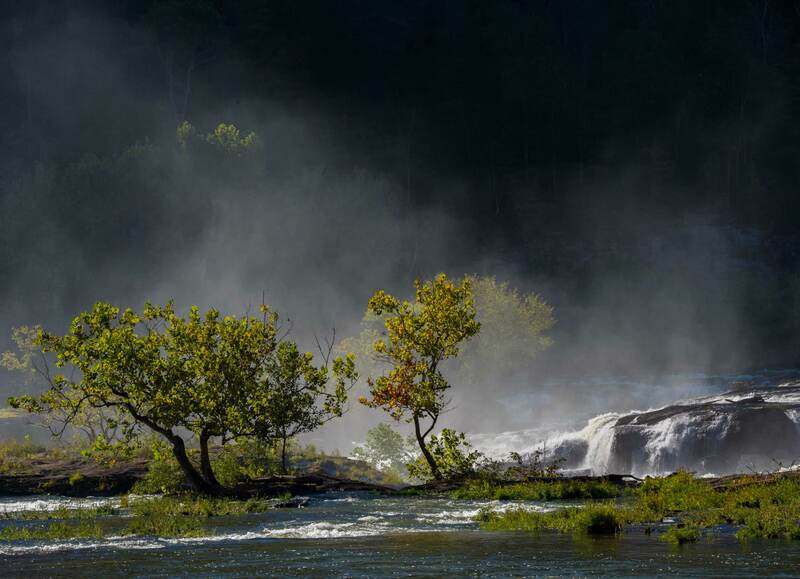 Foggy morning at Sandstone Falls. Hawks Nest State Park offers views of the New River from the side of the river opposite from the Canyon Rim visitor’s center. 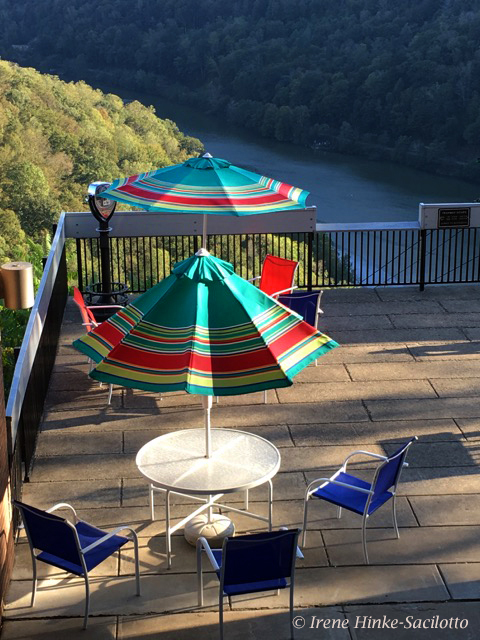 From Hawks Nest Lodge and overlooks from further down Route 60, there are interesting views of the river and surrounding mountains from a high vantage point. Also there is an aerial tramway to transport you from the lodge to the river below. When you reach the bottom jump off point, you can cross a small bridge and following an easy trail upstream to Turkey Creek Falls. 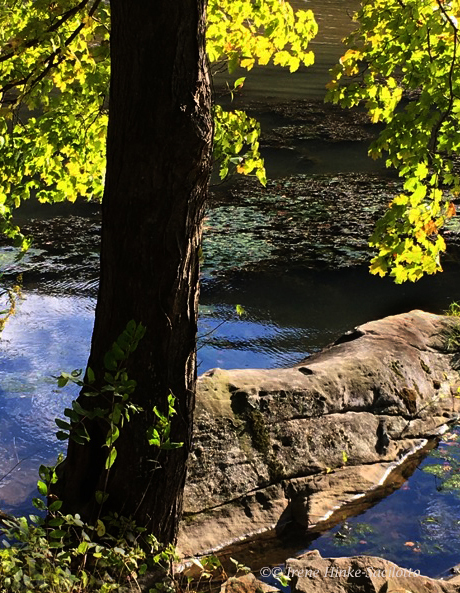 Along the way you can capture photos of the trees gracefully overhanging the river, mushrooms, and wildflowers. Just before the Hawks Nest Dam, you reach a small bridge crossing the creek at the base of the falls. From the bridge and rocks below the falls, you have a good vantage point for photos. 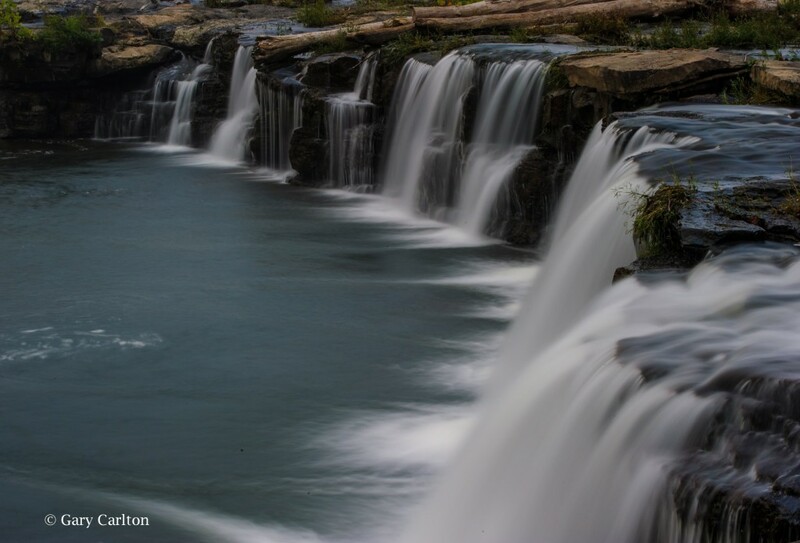 The best images of the falls have been taken in the spring when the flow of water is greater. During my visit this October, the flow was minimal. Overlook at Hawks Nest Lodge. Shot with the cell phone below Hawks Nest on the trail to Turkey Creek Falls. I used it to show workshop participants photo possibilities along the path to the falls. If you continue driving down Route 60 from Hawks Nest State Park, just before the town of Gauley Bridge, you will see Cathedral Falls on the right side of the road. Best photographed with late afternoon light. When the sun is high in the sky, there is too much contrast from the upper part of the falls to the base for a good exposure. 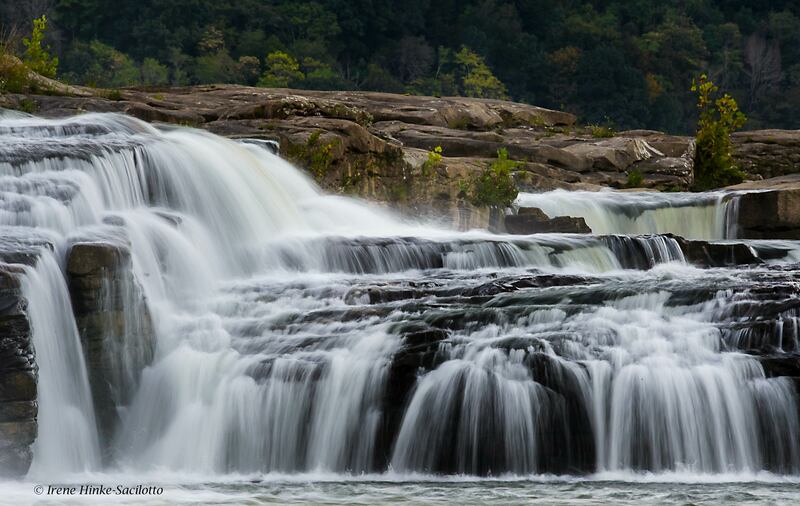 I recommend using a telephoto lens to isolate portions of the falls, a 80 – 400 mm or 70 – 200 mm zoom lens. On the day of this year’s photo workshop, I spotted a rainbow reflecting in a portion of the falls. It would appear and disappear depending on where one was standing and only lasted for a brief period of time. Several workshop participants got great shots of the phenomena. During my scouting trip, the sky was slightly overcast and the rainbow was not present. But I still was able to capture the etherial beauty of the falls by isolating a section and using a slow shutter speed. Note: Typically I do not photograph with workshop participants during a weekend program, preferring to direct all my attention to helping them achieve the best results possible. Cathedral Falls in soft light. 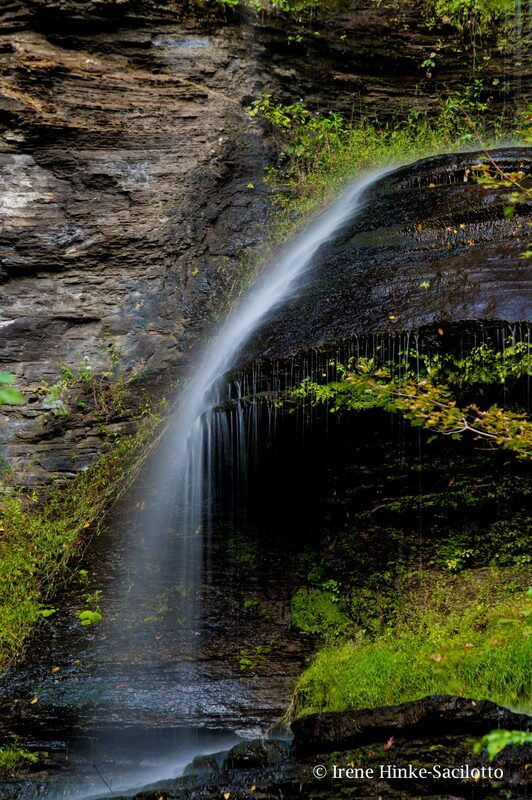 The most beautiful portion of the falls captured with a telephoto lens. A short distance down Route 60 from Cathedral Falls is the small town of Gauley Bridge which provides access to the river for photos of reflections in the flowing water and of geese along its bank. Just southeast of Gualey Bridge is Glen Ferris where Gualey River and New River converge. Here you will find Kanawha Falls adjacent to a hydroelectric station. From a trail used by fishermen parallel to the main road, you can isolate a portion of the falls with a telephoto lens and exclude any evidence of the power plant. 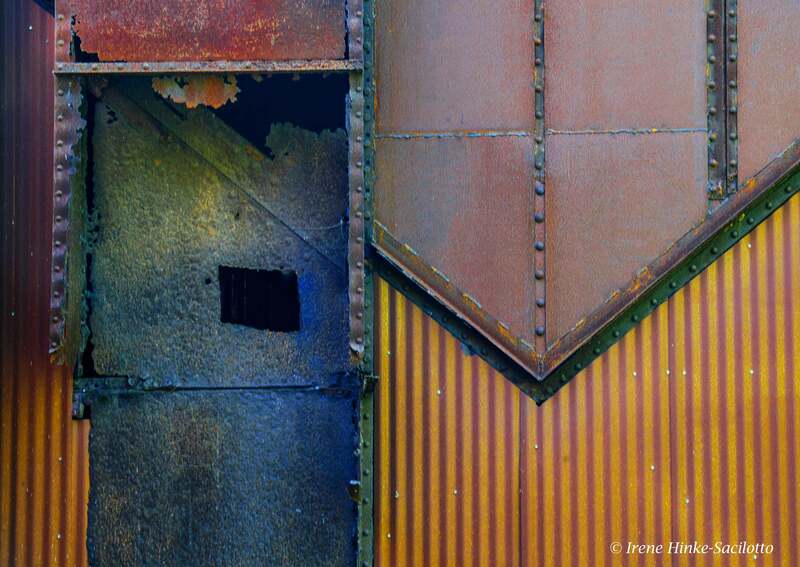 As an alternative, you can photograph the aging brick power station for a graphic image. The historic town of Thurmond was once an active railroad town like many located along the New River. It can be reached off of Rt 19 at Glen Jean Exit north of Beckley. A narrow winding road leads to the town following a stream that cascades down the mountain. On the way down, there is a pull-off that provides relatively easy access to photograph one of the larger cascades. At the base of the mountain, you reach the historic town of Thurmond by crossing an old narrow railroad bridge that spans the river. Ahead you will see a parking lot and railway station renovated by the National Park Service and serving as a Visitors Center. 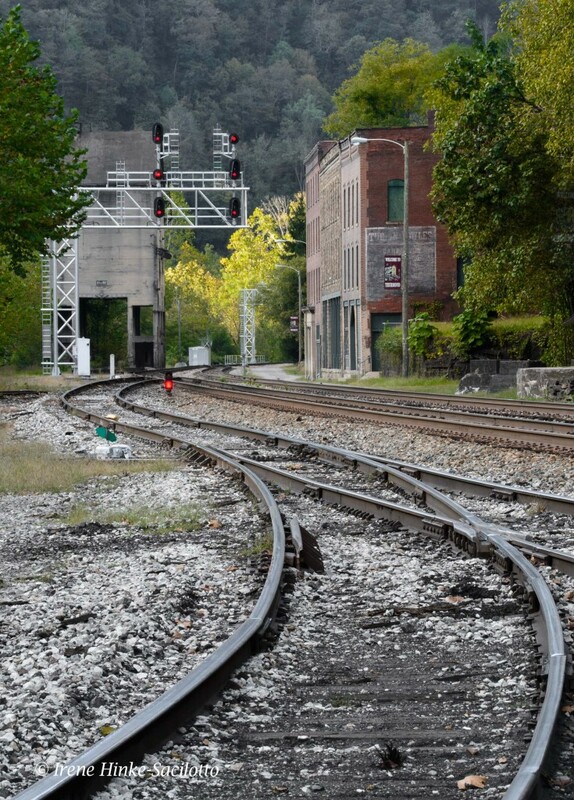 What makes this location special is that railroad tracks run through the center of town. Today only a few buildings remain from the past. However with a wide-angle lens, the train tracks create great lines leading into the frame. If you are there at the right time, you may be able to photograph a train as it approaches. Watch the signals above the tracks for an indication that one is on its way. Cascade on way to Thurmond. Grandview lies within the National Park and provides views of the horse-snapped section of the river from 1400 feet above. In the early morning interesting shots can be obtained as the fog slowly lifts from the canyon floor revealing the river below. A trail follows the rim with a few small overlooks which are partially blocked by vegetation. Another overlook farther along the canyon wall is Turkey Spur. Steps lead to viewing platforms, but this year the upper level was closed due to fire damage. In May and June, I understand the area is quite beautiful with blooming rhododendron along the trails. 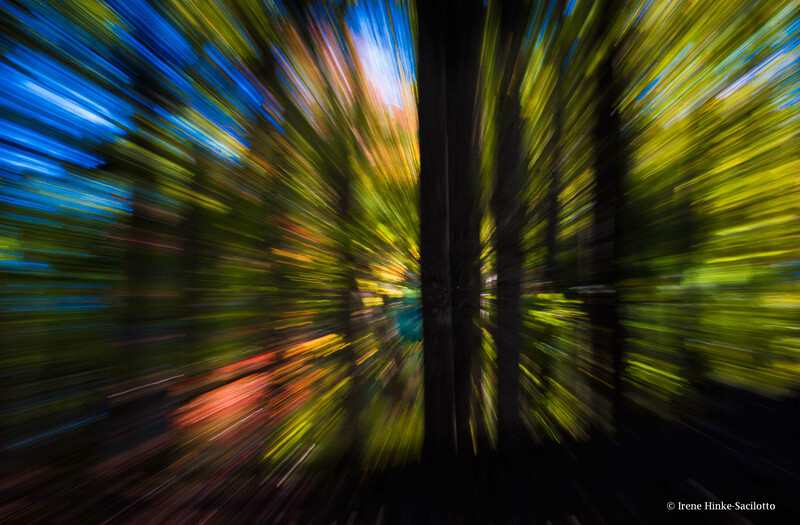 This year there was little fall color but I did take an abstract photo of the forest by zooming my lens during a slow exposure. 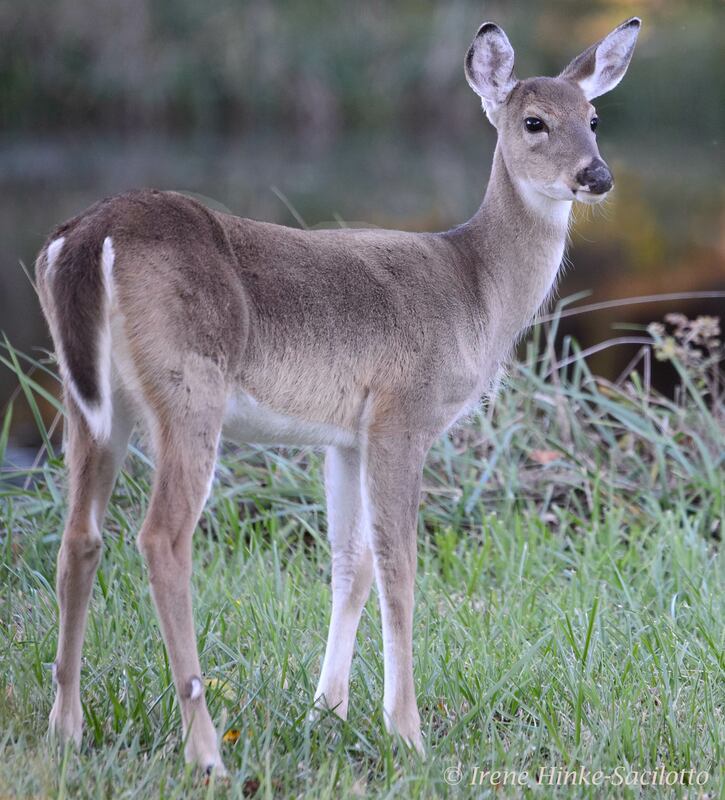 As I exited the park, I grabbed this photo of a white-tail deer. Deer photographed just outside of Grandview. Fall color at Grandview captured by zooming my 70-200 mm lens with my camera set on a slow shutter speed. The 100 year-old Fayetteville Station Road once regularly traveled before the modern New River Gorge Bridge was built in 1977. Access to the road is off of Rt 19 by turning right on Lansing-Edmond Road, near the Canyon Rim Visitors Center. Once on this narrow road, turn right at the sign “Fayette Station Road” and immediately take the left fork. This road is a very narrow with hairpin curves and sections that are only open to one-way traffic. 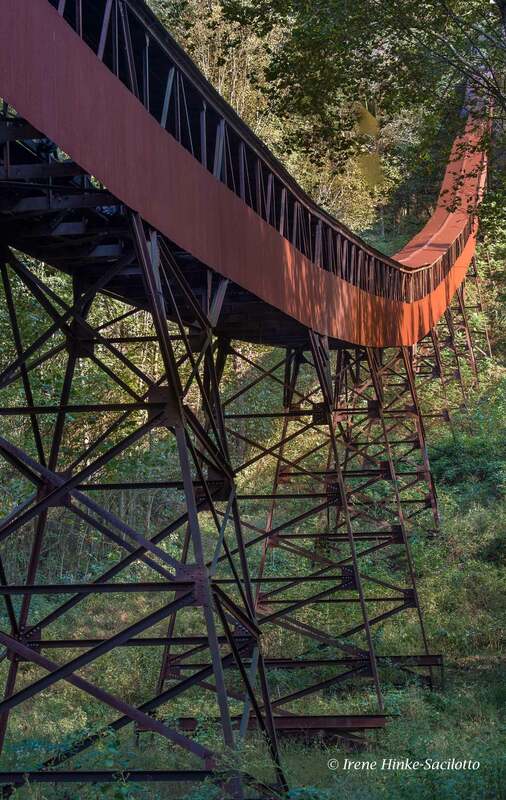 It passes under the current bridge twice, offering unique views of the steel structure. Also it provides access to the banks of the New River, several small waterfalls, and Kaymoor trail which passes a historic coalmine site. The road is worth the drive but is closed to traffic during Bridge Day weekend when the New River Bridge is closed to vehicles an open to pedestrian traffic and BASE jumpers. 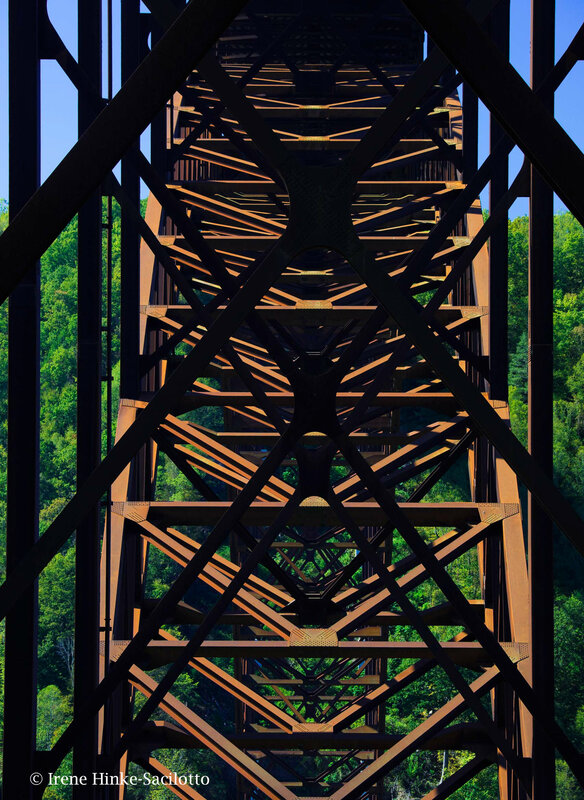 New River Gorge Bridge’s steel structure photographed underneath on Fayetteville Station Road. 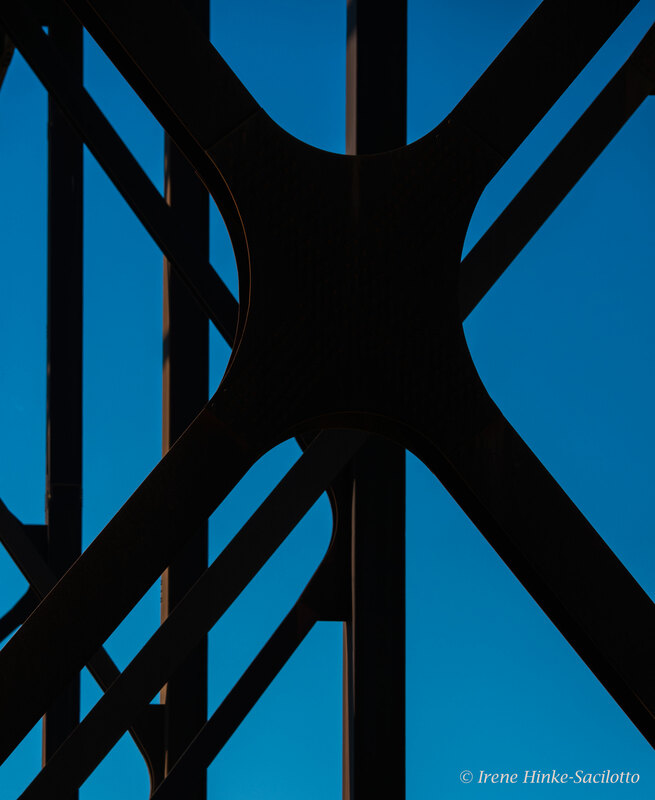 By selecting sections of the bridge’s iron work, you can create interesting abstract photos. Nuttallburg was one of a number of bustling coal mining towns along the New River. The abandon townsite for years was concealed under the cover of trees and vines. It was recently restored by the park service and can be reached from Lansing-Edmond Rd by turning right in the community of Winona onto Keeneys Creek Road. This very narrow road descends into the gorge to a parking area. From here, trails lead to the foundations of buildings and remains of coke ovens that converted the coal into fuel. The most interesting aspect of the site is the coal tipple and conveyor that transported the coal from the mine up the mountainside down to the processing area and railroad below. On a bright sunny day, the scene is difficult to photograph without using HDR technology. The contrasty photo below was taken this fall at mid-day while scouting locations to determine which to include in my upcoming workshop. Coal conveyor at Nuttallburg Town. The amount of contrast in the scene was high resulting in distracting deep shadows and burnt-out highlights.. It would be best to photograph this scene when the light is softer. Side of the old tipple in Nuttallburg Town I was attracted to the colors, shapes, textures, and lines displayed by the wall and took this photo of the abstract design. The side of the building was shaded, perfect for this photo.